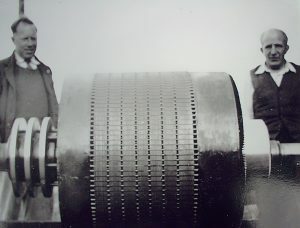 Established in 1921, Boardley & Roberts has built a reputation for consistently producing top quality rewinds, overhauls and engineering services, fast and efficiently in and around East Anglia. This reputation has been achieved by our ability to respond and adapt to the ever changing needs of our customers. Our specialist engineers are available around the clock, offering a complete range of Electrical & Mechanical services both on-site and in-house to help minimise costly down time. Boardley & Roberts are a member of the, ‘Association of Electrical & Mechanical trades’ (AEMT) & the ‘Federation of Small Businesses’ (FSB). We are proud to have very high standards in commitment, knowledge and customer service. Boardley & Roberts has experienced extensive investment over the last few years, with the introduction of our brand new 16,000sq.ft office and workshop complex at Gt Blakenham, Ipswich in 2001. Purpose built to house the major rewind and repair side of our business, with capabilities to handle any size of Electric Motor (inc Eexd explosion proof & high voltage), Pumping unit’s, Generator or Gearbox. Whether the problem is Electrical or Mechanical. Our phones are manned around the clock 24/7 so these and all other repairs can be rectified swiftly and professionally by our knowledgeable, experienced work force. Boardley & Roberts are also an Approved Motor Centre and ‘Authorised Repair Agent’ For Brook Crompton motors Ltd. 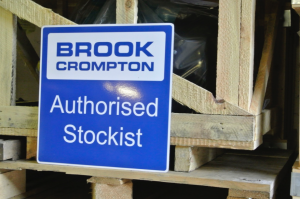 The Brook Crompton organisation started to manufacture induction motors over 100 years ago and has since grown to be amongst the largest industrial motor manufacturers in the World today. Leading the field for High Efficiency levels within the current motor range, Brook Crompton offers savings which include enhanced capital allowances, interest free loans (via the Carbon Trust) & Eff2 -Eff1 energy saving calculators. Ipswich houses our extensive motor warehouse, distributing motors, gearboxes, fans & pumps to all corners of the U.K. 24/7 with our current stock levels far exceeding three hundred thousand pounds. This is backed up by our experienced & knowledgeable sales team. Whether the problem is an urgent repair, or a new replacement needed, Boardley & Roberts Ltd has the ability to solve it.